Get the best in comfort and durability with this reiner. 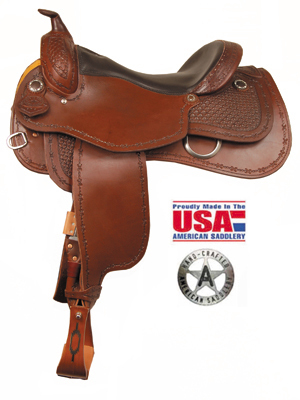 Features soft smooth leather seat, butterfly shaped skirts, wood stirrups with padded leather footpad, hand tooled barb-wire border tooling and decorative brass twisted wire conchos. Available in dark oil finish and 16" seat size only. The JB Reiner II features an additional hand tooled waffle pattern design. Tree: Equi-fit fiberglass covered wood tree by Steele Saddle Tree Co.
Rigging: Stainless steel in skirt rigging in 7/8 position.